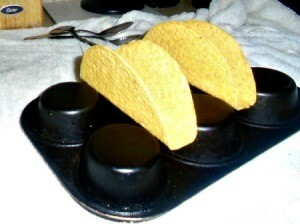 A great way to keep crisp taco shells upright is to use an upside down muffin tin as a holder. It will make them easy to fill. This is a guide about using a muffin tin to hold taco shells. Taco Night? Turn your muffin tin upside down and place the shells in between the cups. They will stand erect and let your guests fill them up! I have gone to the Dollar store and purchased small muffin tins, once for each member of the family. When I make tacos, I have to hold with one hand and fill with the other. If you stand the taco shell on a muffin tray turned upside down, it holds the taco in place while you fill it.